The party is asking the Irish government to make a Northern Ireland constituency. Irish and EU flags side-by-side in Dublin. 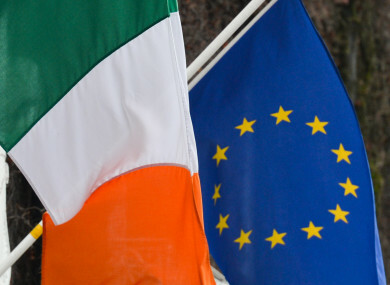 IRELAND IS TO get two more European Parliament seats because of Brexit and Sinn Féin is calling on the Irish government to give them to Northern Ireland. The call was made in a Sinn Féin submission the Constituency Commission which argues that citizens of the six counties of the north should continue to have representation in the European Parliament. The majority of voters in Northern Ireland voted for the UK to remain in the EU and the border issue has emerged as one of the key stumbling blocks during Brexit negotiations. Of the current 751 MEPs, 73 are held by representatives of the UK and it’s been recommended that after Brexit 27 are to be filled by current EU members and 46 be kept vacant. Ireland currently has 11 MEPs and it has been proposed that this will increase to 13 under the post-Brexit shake up. Northern Ireland currently elects three of the UK’s 73 MEPs. The Irish government is currently engaged in a review of the European Parliament Constituencies and as part of that process is considering the increase from 11 MEPs to 13. Sinn Féin’s submission is made to that review and argues that consideration should be given to the fact that the review is only happening because the UK is losing MEPs. “The very reason why the review of the European Parliamentary constituencies is happening is because of Brexit. That cannot be ignored in the deliberations of the Constituency Commission,” the document states. Sinn Féin believes that the citizens of the north should continue to have democratic rights & thus representation in the EU Parliament post-Brexit. Speaking today as the party launched its submission today, Sinn Féin MEP Martina Anderson said that voters in the south would not lose existing representation. “We are proposing that the Constituency Commission consider the creation of an additional constituency, one for the north. It would have two MEPs, the two that Ireland are set to receive as Britain leaves the EU,” Anderson stated. We are not asking for voters in the south to sacrifice existing representation, merely help preserve that right for those who did not vote for Brexit but are now forced to accept the ramifications of others’ shortsightedness. Sinn Féin’s submission points to comments from Fine Gael and Fianna Fáil politicians indicating that citizens in the north should continue to elect MEPs after Brexit. Fianna Fáil leader Micheál Martin has previously suggested that Northern Ireland should continue to have representation in the European Parliament and Fine Gael MEP Seán Kelly has said that it is an idea “worth exploring”. Email “Ireland is getting two more MEPs because of Brexit and Sinn Féin wants them to go to the North”. Feedback on “Ireland is getting two more MEPs because of Brexit and Sinn Féin wants them to go to the North”.